Short of a long beard, few things give away a trans woman more often than "the way they walk". Sadly, I've seen full-time TS women come up way short in this aspect of their presentation - and then marvel over "why" people treat them as male. Want to pass in public? Its essential you enhance this aspect of your female presentation. We don't want to do anything that reads "different" - which means people look closer for why that is: created unwanted attention to other details. There's a number of simple tricks you can use to walk more feminine. To develop these skills - I would suggest you practice while wearing heals. Importantly, practice wearing the heals you'll most often be wearing in public - I learned this aspect the hard way after getting overly accustomed to adorning 6" platforms during my years as a kid & crazy club girl - then being completely unprepared for walking in 3" heals after I transitioned. As you're about to learn - heals are somewhat of a byproduct of why women walk differently than men - they force you to change your cadence. Additionally, they lower your center of gravity to more congruence with a female and they'll make your booty poke out a bit: all things we want to accomplish in this process. Finally, you'll be walking in heals when you're out in public. The more miles you log privately - the less likely you are to endure an embarrassing mishap publicly. Every woman's crashed and burned walking in heals: they're just less stable. However, we want to minimize that likelihood. Take Smaller Strides - Another byproduct of wearing heels? Its safer to take smaller strides. The more balanced our center of gravity? The more stable we remain. Thigh Lead - then "pull". Remember our thigh-lead approach to walking we just discussed? If you'll use that technique - along with a smaller stride - and then use your forward thigh to "pull" your body further forward? Your hips will sway by default - creating a naturally more feminine cadence. Wearing heals as you walk magnifies this situation by lowering your center of gravity. Glide - Don't Clomp - Another fallout from wearing heals that makes women walk differently from men? It's not safe to lift the foot above the ground significantly when walking: creates danger falls from uncertain landings. Essentially, you should be landing on the toe of our foot: not the heal. This takes a good bit of practice to master after a lifetime of walking male. You don't want to drag your feet - you just want to lower the total rise in your foot lift. How you walk plays a huge role in presenting as female - but its just half the equation. The reason a lot of beginning crossdressers (even some TS women) don't present well in public is posture. I'll confess: this was my early downfall - both when I started going out n public as a crossdresser and just after I transitioned to full-time. I think its partly human nature: when we feel shy and afraid? It's somewhat natural t slump our shoulders and eyes downward into more fearful "don't look at me" body language. Unfortunately, few things draw eyes more quickly than a "slumped over" female. How do we beat this challenge? Simple - practice! How we do one thing - is how we do everything. 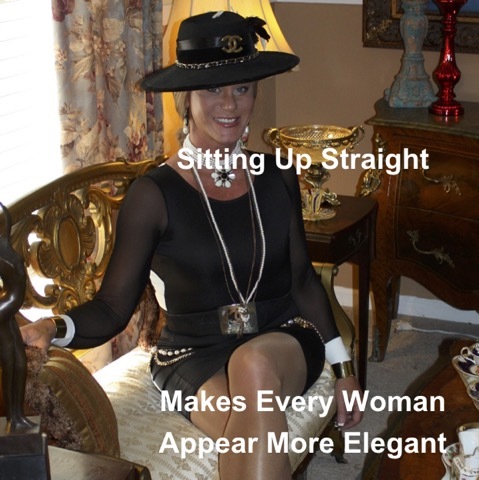 There's nothing that will make you look ten pounds lighter (without dieting) and make all your clothes look more regal and elegant than good posture and a graceful walk. At first - it will take practice: in from of a mirror as you first learn. Then - the muscles will start to memorize these new movements and the brain will follow: it becomes easier. You can pacice while carrying things from room to room - or while cleaning the kitchen. Don't get discouraged if its doesn't happen quickly. Head Erect - chin parallel to the floor. Tummy in - never let your waist settle down on your hips - this trick alone will make you look pounds thinner. Elbows slightly bent - drawn towards the body (not outward like men) and palms turned in towards body.